It arrived, today. My new Microsoft Surface RT was brought to my door by the UPS delivery man. So far, it is one of the best toys I have ever bought. As I am starting a new college career this week, I was interested in how far I would have to walk from my parking place to the classroom building. When I registered the only parking left was in what is called the Central Parking Garage. Now, as you may have guessed, the Central Parking Garage location is anything but central to anything on the campus. Noooo! The damned thing is diagonal across the campus from my classroom building, a good half-mile. It is all downhill, but the catch is that it is all uphill to get back to my car. Well, all this leads up to my decision to acquire a tablet computer because it would weigh considerably less than my 15 inch screen laptop. After evaluating about a dozen different tablet computers, I decided on the Microsoft Surface RT. It weighs about 1 ½ pounds, and does pretty much anything I would want to do for my math classes. You see, there are computers in every classroom at every desk position. So, I could legitimately get by without a personal computer. Now that I have my new toy, it is time to evaluate. The package I bought included the touch and type cover. I was afraid this would be a problem for me since I am not a true touch typist. However, I find the touch keyboard to be adequate. It is at least as easy to use as a regular keyboard. I just have to remember to get my hand and arm spacing comfortable. The Surface RT is a thing of beauty. The packaging is nice, of course, but so is the actual product. It has the look and feel of an expensive piece of electronics. The price for the package was $349, plus another $100 for the cover/keyboard. 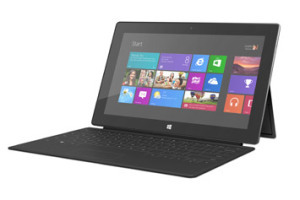 If you check the price of comparable tablets, the Surface RT offers a greater value. Microsoft thought enough ahead to install a full USB 2.0 port, a MicroSHDX memory chip port, plus a port for video output. You have to buy a special cable for the video output, but you can get one to patch the HD video out to your big screen via HDMI interface. The battery is supposed to last about nine hours, but since I have the unit on charge, now, we will just have to see. Understand that I came to my decision to buy the Microsoft Surface, even though we already own an Apple iPad, and a Kindle Fire. I have never been impressed with the performance of the Apple iPad. It is a nice machine, but does not have a convenient port for accessories, nor does the Bluetooth keyboard I bought for it measure up. Now, there are after-market keyboards available from third party suppliers, but I have already spent my money on a virtually useless accessory made by Apple. The Kindle Fire is first and foremost a great reader. You can surf the web, but the seven inch sceen is not satisfactory. Now that I have the Microsoft Surface RT, I am a happy camper. As time goes by, I will blog more about the machine, being honest about the worth of Microsoft’s entry in to the tablet market. I don’t understand why more of this great product are not being sold, especially at the current price. Oh, I forgot to tell you that students are currently getting a ten percent discount from Microsoft online at the Microsoft store. I agree with you about the drawbacks of the iPad. I’m curious about the Microsoft Surface RT. If I read enough reliable reviews of it, I may buy one. Thanks for letting us know that you have this device, and I look forward to your detailed evaluation.